"If we are the experiment that finds dark matter, we can change the fundamental understanding of the universe as we know it," said UH assistant professor Andrew Renshaw. "We can really start to understand the fundamental properties of the universe – how we got from the big bang to where we are, and what the future holds." The UH team is using the DarkSide program's first physics detector, DarkSide-50 (DS-50), located underground at the Gran Sasso National Laboratory in Central Italy. The team and their collaborators have improved the sensitivity of the DS-50 detector in recent years by switching from atmospheric argon to low-radioactivity liquid argon, which was extracted from underground gas wells in Colorado. But a next-generation detector in development will take it even further. "Previously, if you wanted to look for a specific kind of dark matter, you really had to look for a specific kind of detector. 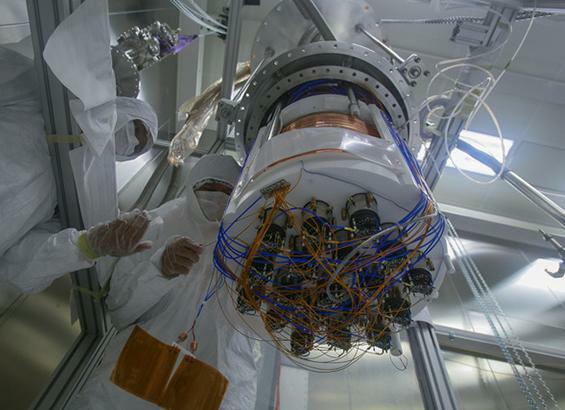 Now with this liquid argon technology, it's really opening the door to using a single technology to search for a handful of different kinds of dark matter," added Renshaw, who recently presented DarkSide findings at the UCLA Dark Matter Conference. "The cryogenic system keeping the argon in liquid phase needs to be monitored, and some operations are needed to allow for the good performances of the detector. Electronics are monitored. Signals coming from the detector are improved, if needed, and the quality of data is routinely checked," Canci said. UH's participation in the DarkSide collaboration is funded by a $200,000 annual grant from the National Science Foundation.